A drawing by Dominguez, shown below, demonstrating how to arrange the pieces of his sculpture-turned-dinnerware set, reveals that the artist did indeed intend these pieces to have their own “right places.” He intentionally confuses the border between fine art and functional objects, and his work creates a tension that makes one consider what kinds of objects these two categories actually define. For Dominguez, they are not mutually exclusive. Yet he sells himself short – this set is certainly fun, but a lot more can be learned from observing exactly how Dinnerware as Fish Aquarium presents itself. 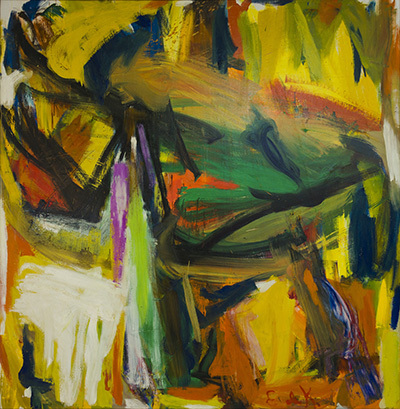 The way that Dominguez has painted these pieces shares similarities with the style of Abstract Expressionist painters who found inspiration in the American Southwestern landscape (as can be seen in Albuquerque, 1960, by Elaine de Kooning). Yet, in an example of how diverse the various influences of Dominguez’s work can be, the careful and reverent assembling of the pieces is reminiscent of the arrangement of religious figures in a Neapolitan crèche. Furthermore, the color palette and exuberance of pattern on Dominguez’s dinnerware pieces recall the folk art tradition of the American Southwest that surrounded Dominguez during his childhood in Tucamcari, New Mexico. 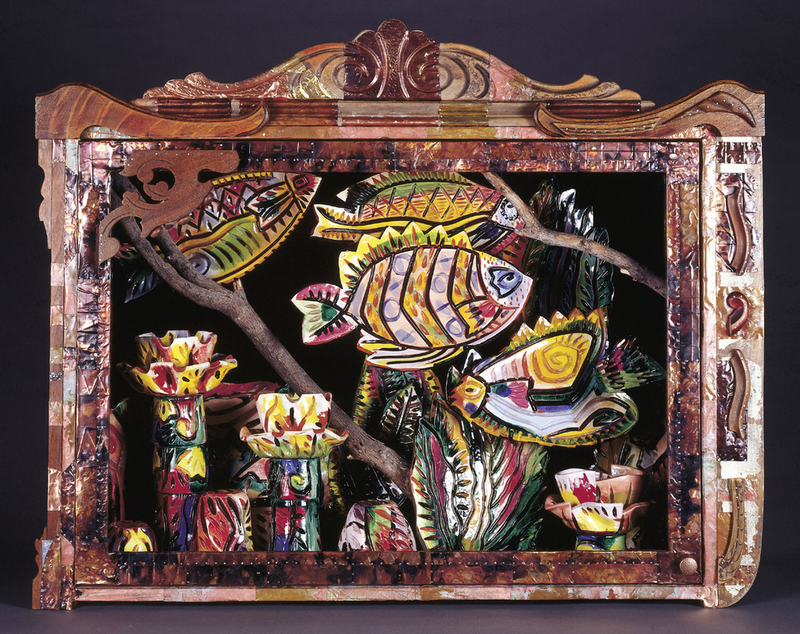 This folk art style blends the influences of Old World Spanish tradition and southwestern Native American sensibilities. The dinnerware set is also a product of Dominguez’s personal fascination with domestic interiors. He appreciates the idea that household items can become imbued with a particular brand of sacredness simply because they have personal significance to the owner. Dinnerware as Fish Aquarium demonstrates a celebration of and reverence for everyday objects and allows everyone to see the magic that Dominguez has seen in these objects all along. Thanks to Danielle Johnson for highlighting this object from the Product Design and Decorative Arts Department’s collection. It has been a great summer in PDDA! [i] Dianne Pilgrim quoted in “Seeking Beauty: What 22 style-setters just can’t stop thinking about,” Elle Décor (1996): 96. [ii] Eddie Dominguez quoted in Nancy Ellis, “Master of Many Trades,” FOCUS/Santa Fe Magazine, October-November/December (1990): 33.